Happy Monday #PoiseNation. July is almost over! Keep soaking up the rest of the summer and don't forget to take advantage of the summer schedule before it is gone! Reminder that Poise Fusion Xpress is held every Wednesday at 12:15pm. This 40 min class gives you just enough time to workout with us on your lunch break! Starts this Tuesday at 5PM. Sing up today! Join Expert Registered Yoga Teacher, Sara Bailey for Poise Power Flow! Set in a lightly heated room, you will be guided through a powerful and strong practice where we focus on linking conscious breath with mindful movement, careful alignment and stretching. You will be guided through postures in a Vinyasa Flow Yoga style, beginning with the basic poses, but allowing for more challenging and invigorating poses and movement if you see fit. In this energizing class, you will flow through a series of postures that will build strength, release tension and allow for deep stretch. Loving our Reebok In-studio slippers or in need of a new pair? Please place your order by Friday 7/27! Account on file will be charged and they will arrive within a couple of weeks! Click here for a general review of our studio poise policies. Be mindful that these policies are followed by both instructresses and members. We kindly ask for everyone to leave their cellphones and other devices outside of the studio rooms. This not only helps you focus but also those around yo. Thank you! Forgot a hair tie to class? No problem! 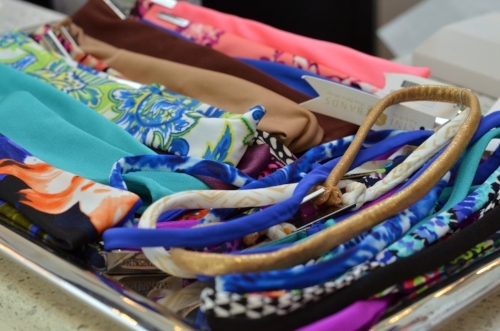 Want a trendy headband? We got it! Kini Bands have hit our SP shelves. Purchase your hair ties, headbands, and hair wraps that are perfect for barreworke or even the beach! Get your Kini Bands while supplies last.